Most of us will go great lengths in getting our hair to look shiny, healthy and bouncy using a myriad variety of products. However, all of those fancy products do not always give us great results because we do not treat the intrinsic problems of nutrition, maintaining good fitness levels and combating stress levels that cause hair fall and hair damage. Yoga and meditation help in relieving the body of its stress, promote hormonal balance and increase the fitness levels of the body. Combine this with healthy, nutritious food. This automatically means a healthy body and healthy hair. There are many asanas that help in combating hair loss. While it will not stop hair loss altogether, what it will do is reduce it to a great extent. Also, it is most advisable that you start doing these when you see the first signs of hair damage and excessive hairfall. Most of these asanas focus on getting your breathing right, reducing stress and improving the circulation to your brain. Let us see what the asanas are. In this asana, get down on all fours- your hands and feet are flat on the ground. Feet are hip width apart. Raise your hips such that your body forms a “V”. Pull your belly button close to the spice. Let your head hang. This asana helps in aiding digestion and releasing the gas in the body. By ensuring that you are having a clean digestive system, you can be guaranteed that your hair will grow better and be healthier. Lie on your back with feet together and arms on the side. Breathe in and out. As you exhale, bring your right knee towards your chest. Hold it with your hand. Press the thigh to the abdomen. Take deep breaths as you hold the pose. Exhale and go back to original position. Repeat with the left leg. Finally, do it with both your legs together. Lie down on your back with the arms on the sides and palm flat on the floor. Bend your knees. Now raise your legs up so that your body is balanced on your shoulders and palm. Hold this pose for at least ten breaths. If you are a beginner, take it easy and do not overdo it. This asana gets blood and lymph flowing to the brain and relives stress and fatigue. Kapalabhati is one of the easiest ways to reduce stress in the body. 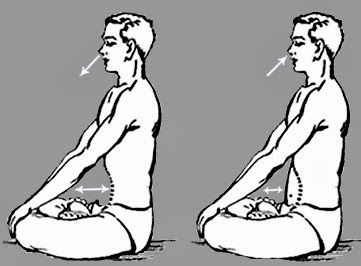 The asana involves consciously moving your diaphragm by doing active exhalations. To do it, sit erect and close your eyes. 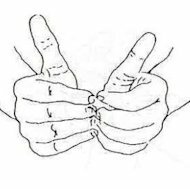 Join your thumb tip with the index finger tip and rest your wrists on the knees. Relax your body. Inhale normally. Next exhale sharply, contracting your stomach muscles, pulling it towards the spine. Keep your mouth closed. Repeat this continuously for 20-40 counts. This asana expels the toxins from the body and is good for the nervous system. The brain cells receive oxygenated blood during kapalabhati and this helps in hair growth. This is another popular therapy for hair fall. It involves rubbing your fingernails together with a certain amount of force. The tips of the finger are directly connected to the roots of the hair. Rubbing them together will help improve circulation to the hair. This automatically improves hair growth. For fifteen minutes in the day, while watching TV or relaxing, rub your nails together.